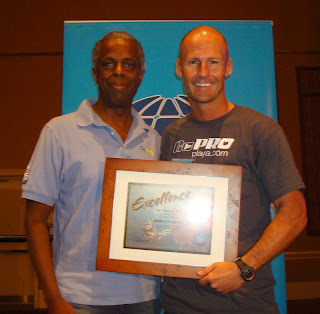 Pro Dive Mexico Course Director Anders Heegaard was at DEMA 2011 show once again awarded as a PLATINUM Course Director by PADI. There are only a handful in the world! In the picture you see JAMES MORGAN, PADI Americas Vice President of Training, together with Anders, receiving his award. Congrats Anders, on a job well done! 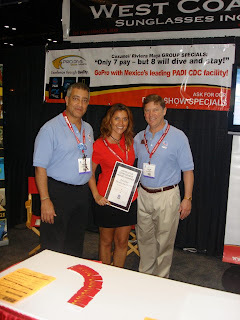 DEMA show Orlando has been very successful for us! 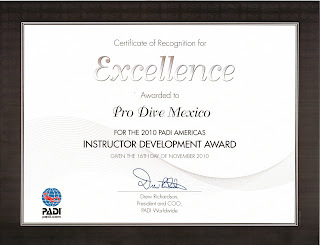 The first day of the show we have been awarded once again for excellence in instructor development in latin america. 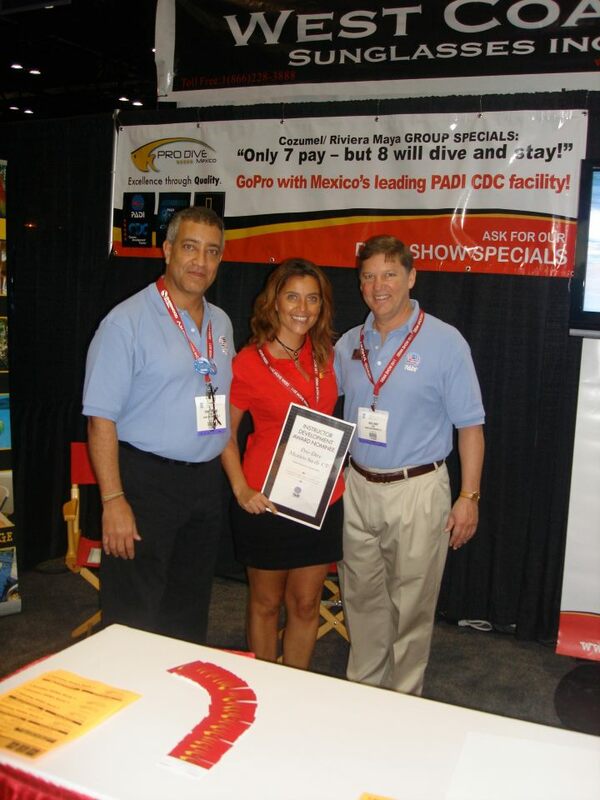 In the picture you see our operations manager Maria Jose Lledo Jara, receiving the award from Nick Jenny and Robert Sievens, PADI regional manager of latin america. We are proud to be one of only three latin american IDC centers to receive this 2011 award! Yes, it was a great fun day once again!!! 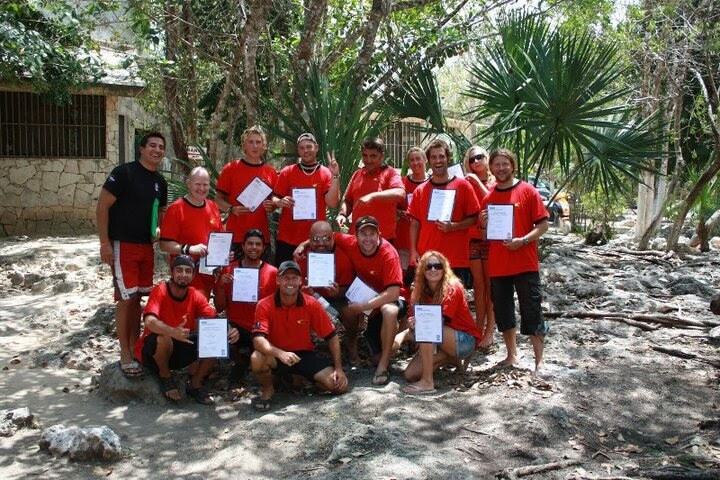 The second annual Scubapro & Pro Dive Mexico TEST DIVE was again a huge success, and of course a lot of fun! 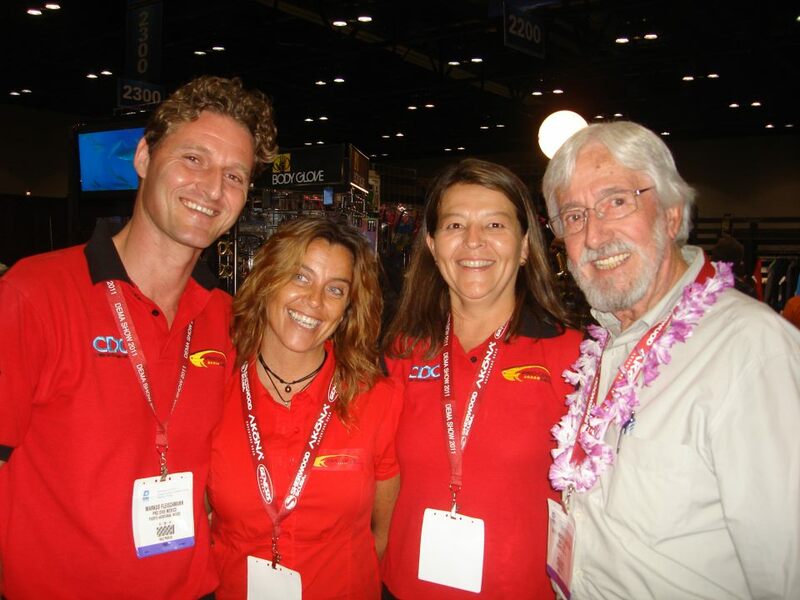 Scubapro Latin America Sales Manager Mr. Roberto Quintana, and Scubapro Mexico Representative Mrs. Silvia Maiz, accompanied by Platinum PADI CD Anders Heegaard and his Pro Dive Mexico colleague, former Queensland, Australia PADI regional manager Jim Hutchinson. The event was also attended by our GOPRO Assistant Paolo, our italian Maroma instructor Valentina, videographer Leandro as well as by some of our eager Gopro candidates, who sure enjoyed to be part of the great event! Our fun group was evaluating some exciting new SCUBAPRO gear and items, and the test results will serve the manufacturer in its decisions to launch the products, as well as help our CDC facility determine what equipment will be useful and resistent enough for daily operations. Pro Dive Mexico is an authorized Scubapro dealer, and we only use the worlds Best scuba gear brand for our operations, since only the Best is good enough for our GOPRO Scuba Academy. Because we know that....DEEP DOWN YOU WANT THE BEST. We are happy to announce that this year we will be exhibiting at DEMA show, in Orlando, Florida (Nov 02 until Nov 05). Come visit our booth for a chat and info on latest news, dive travel info, our Scuba Academy and unbeatable and EXCLUSIVE special DEMA offers! See you there! Pro Dive Mexico Instuctor takes the plunge! 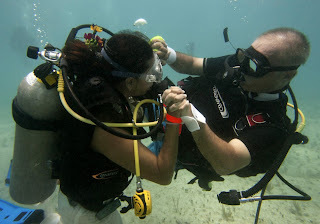 Our dear friend and instructor Alberto da Lago got married underwater! He took the plunge with his now wife Karla, along with more than 200 participants attending the ceremony underwater. Although they slightly missed their entry in the GUINESS BOOK OF RECORD by a few divers, it is the intention that counts, and of course getting married right? Besides sealing their bond for life and breaking a record, Karla and Alberto also intended to create awareness about the local sharks having in mind, that new protective local laws need to be created. Next to many diving friends, there was a lot of of international press as well, so besides getting married Alberto and Karla are now also famous, and their noble message reached the community worldwide!! Congratulations Alberto and Karla, and all the best for your future life together! Just a few days ago Pro Dive Mexico started the April IDC with students from all over the world. With students coming from England, France, Belgium, New Zealand and USA, makes this IDC a very interesting melting pot of culture and opinions. "Teaching IDC's is not only my passion, but also so rewarding for me, as I on every course learn something more about instructor training from the students. They bring with them new ideas and believes that help me understand to better teach this level of courses." So far this IDC had had the best weather possible, with a heat wave of high tempratures, sunny days and clam seas. 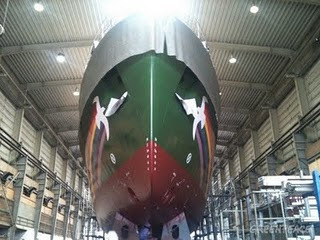 Stay updated on the this site and facebook. This Sunday at Cenote Ponderosa, Pro Dive Mexico's instructor candidates showed their skills and all passed the 3 day exams held by PADI headquaters. It was the work of 2 weeks of training with Platinum Course Director Anders Heegaard and his staff. 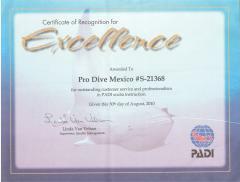 "It was all my pleasure to teach this IDC and sure that we will see many of the new instructors again either here in Mexico, or in other popular dive destinations around the world." Eian, Arturo, Anders (Course Director), Manuel, Matt, Karolina. As part of the IDC with Pro Dive Mexico we had arranged again 1/2 day of Technical diving introductions. The presentation fits perfect with the timing of our new GoTec department and special dedicated website, devoted to those who wish to take the next step and go beyond the limits. The morning started with a short classroom presentation on the courses and the special equipment. Also included was a introduction to cave diving and why this area of Mexico is cave diver heaven. After a short break we hit the pool and tested out the new gear in the water. First with just with the doubles on the back, then after with doubles and a stage tank. For all the candidates it was the first time with more than just one tank. 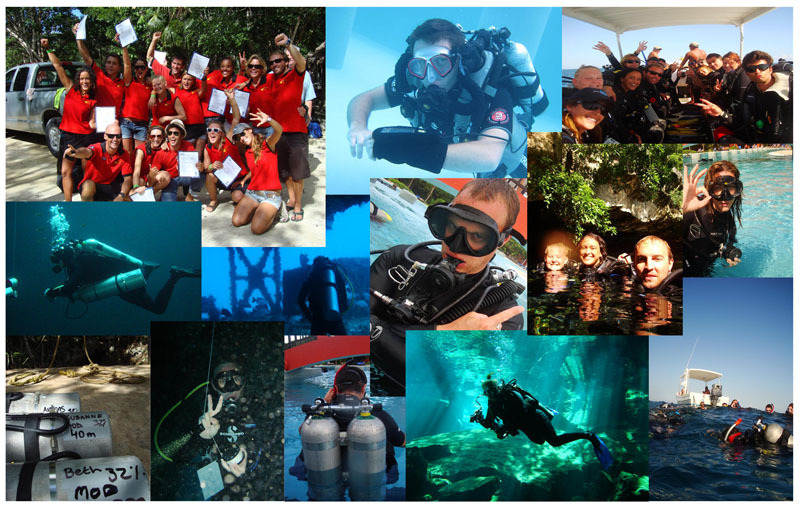 This Wednesday we will start with the PADI IDC prep days. 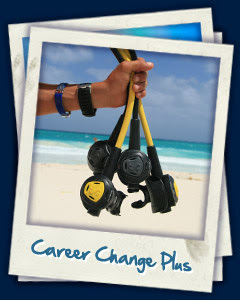 Students will use these 2 days to prepare themselves for the upcoming PADI IDC training which starts this Friday. This year we have many students signed up for this class and you may follow them for 14 days via facebook. We wish them all good luck and see them all at their graduation day in 2 weeks. 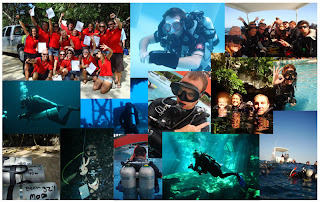 We still accept new students for April PADI IDC class, Sign up now.